Duvet generates nice-looking coverage reports for your Dart projects. duvet will then run your tests and collect coverage, outputting the report to a coverage directory. You can also pass the --serve option to automatically start a webserver to access the coverage reports. 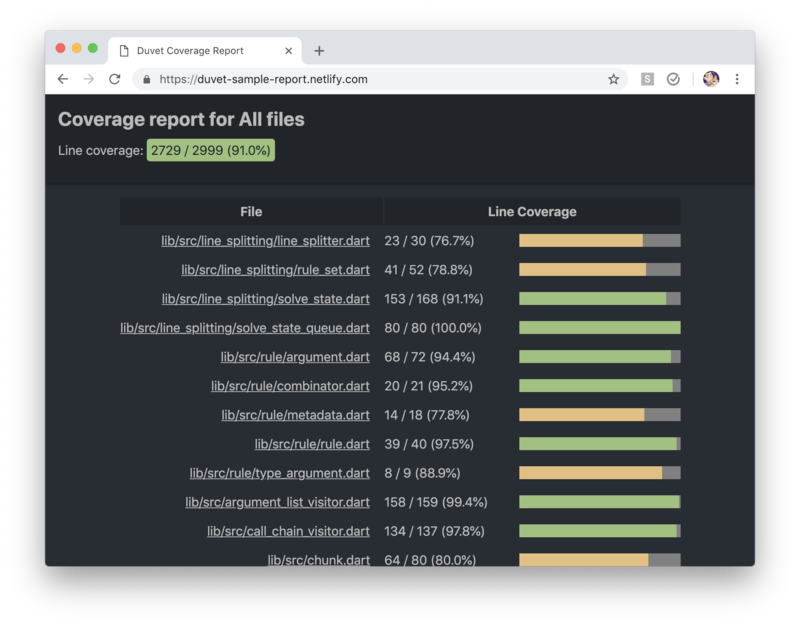 You can view a sample coverage report for the dart_style package here. duvet works by running the test package against your project, and then using the coverage package to collect coverage information. It then assembles reports using hyper, and serves the reports using shelf. Primary library: package:duvet/duvet.dart with components: io. line 69 col 5: Future results in async function bodies must be awaited or marked unawaited using package:pedantic. Common filename patterns include main.dart, example.dart, and duvet.dart. Packages with multiple examples should provide example/README.md.